As I mentioned in my review for Legends-Class Bumblebee, the Titans Return line has impressed me. Along with some new and awesome representations of classic characters, the transformations have been interesting and the sculpting has come on leaps and bounds. Then I saw it. I bought this at the same time as getting Hardhead and Scourge and he was instantly my favourite of the bunch. And still may be my favourite from the entire line (at least until I get Kup). This figure is an absolute beauty. His robot mode is one of the best I’ve seen for a while in terms of retaining that signature Blurr aesthetic while simultaneously updating his look. 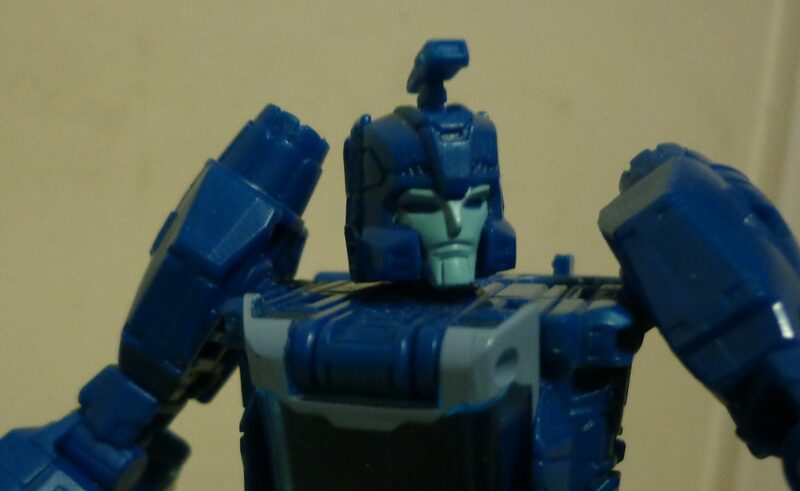 The face sculpt is undoubtedly Blurr even with the little hood ornament thingy on top of his head. The way the vehicles canopy becomes his chest is really cool with the seat filling in the abdomen. Even his’wizard’s sleeves’ on the back of his forearms isn’t too obtrusive. 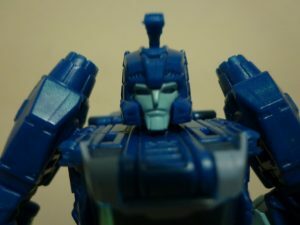 It all leads to Blurr having that sleek look that you’d expect from the fastest Autobot that ever set foot on Cybertron. There are a few areas that could’ve been improved and, irritatingly, they were on the Japanese Takara Legends version of the toy. 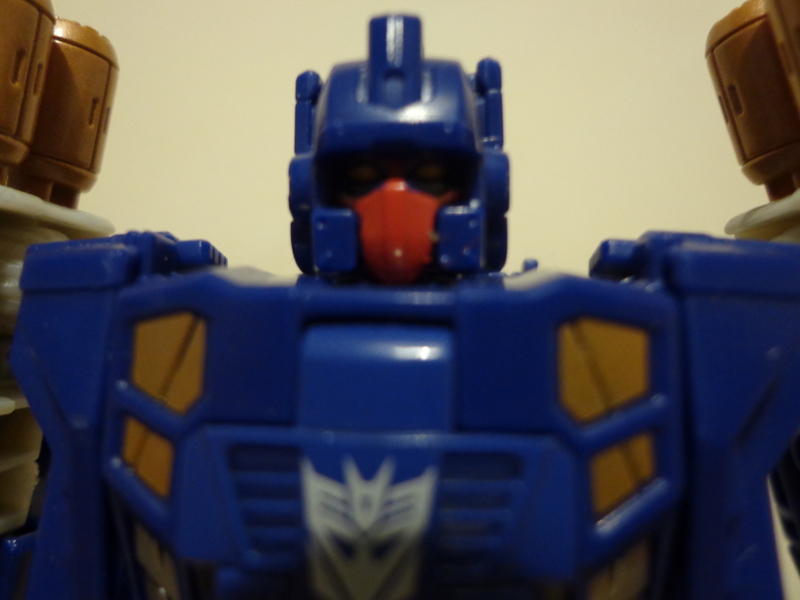 The Takara Legends version has added some G1 accurate paint apps that enhance his appearance tenfold. I don’t really want to fork out double the price for the same figure so I’ll likely pick myself up the reprolabels set from Toyhax.com in the near future. 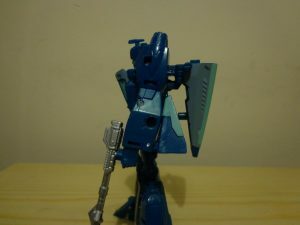 It’s a shame that there’s not a lot of paint as Blurr has a lot of molded in detail that just seems to get lost in the blue plastic. Transformation is fairly routine on this figure although not without its highlights. 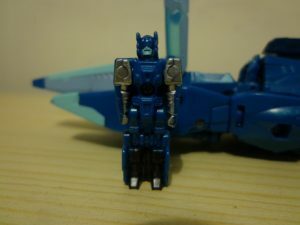 Blurr’s little spoiler thingy folds out from one of his legs before the legs fold up to form the back of the vehicle. Transformation is heavily inspired by the G1 toy. The resultant vehicle is a fantastic update of the original’s alt-mode, that of a sleek, futuristic car. Again it’s missing a few paint apps that would make it coloured similarly to its predecessor but again, reprolabels will sort that out. The vehicle doesn’t roll amazingly well and that’s down to the tiny wheels on its undercarriage and the fact that it doesn’t really have a lot of clearance. 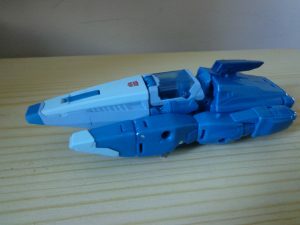 What it does have is an opening cockpit for his Titan Master; Hyperfire. Hyperfire can sit in there quite snug and barely rattle when shaken. The cockpit is surprisingly detailed when you consider you can’t see it 90% of the time. Hyperfire’s seat has ribbed texture and the dashboard has molded in details. It’s totally unnecessary whilst at the same time, totally welcome. Molded detail is one area where this vehicle mode really surprises me. While a lot of it can be seen in robot mode, the alt-mode is where it really pops, in my opinion. There are panel lines along the sleek exterior that add depth and layers to the vehicle. Again, with some extra paint application, Hasbro could’ve really made these details stand out. The plastic quality is a real step up from Combiner Wars. There were a few times in that line where I felt like I would break something because the plastic was really soft. Not the case with Blurr. He feels solid. At no point does he feel like he’s going to fall apart. Just in general, it feels like more work has gone into the build of the toy. The plastic has a metallic pigment which gives him a sheen in certain lights. The drawback being that there are one or two swirly patterns where the pigment hasn’t quite been mixed in enough. Unless that was the intention, in which case I’ll shut up. 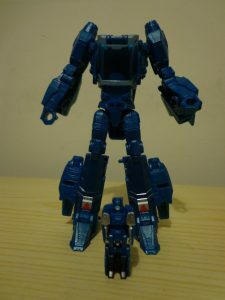 Now, onto this lines gimmick; the Titanmaster. As this was the first one I bought, I really had nothing to compare it to. Now I have a decent collection of these and I can honestly say, Hyperfire is one of the better Titanmasters to have come out of the line. Why, you ask? Well, first of all he’s one of the few with paint on the body. And not just one colour, but three which when added to his base plastic colour, gives him four colours! Because of this, he’s more visually diverse than the deluxe toy he’s packaged with. To break it down for you, he has a sky blue for his lower face, silver on his arms and black legs. It makes for an aesthetically pleasing little fella. He has the usual points of articulation at this scale. His head is on the tiniest ball joint I think I’ve ever seen, as are the arms. It doesn’t give a huge range of motion due to the size and design but it’s still a nice touch. The legs are joined together as one piece just like the G1 Headmasters. An issue I discovered with later Titanmasters is that the hip joints can be very loose. Luckily that issue doesn’t affect Hyperfire. So I think I have gibbered on about this toy long enough. Needless to say, I think this is one of the best in a whole range of awesome deluxe class figures (more on those later). A few minor missteps and cost-saving measures prevent it from being perfect. It’s a real shame Hasbro are skimping on the paint these days. But you couldn’t go far wrong if you picked this guy up. He’s a great update to a fan-favourite character, that incorporates one of the better gimmicks from the old 80’s line and does it well for the most part. He comes highly recommended.